A local Saratoga kindergarten teacher, Ms. Betty Peck and her friend, a local journalist, Ms. Jacqueline Welch, learned about Alan Chadwick’s horticultural work from their daughters. Their daughters were attending the University of California, Santa Cruz at this time, 1971-1972. Betty and Jacqueline visited the campus, toured Alan’s Garden there, and attended several of his public lectures. They were then inspired to ask Alan if he would assist them in the creation of a community childrens’ garden in Saratoga, California. According to Betty Peck, Alan gave them a wholehearted, theatrical “Yes!”. 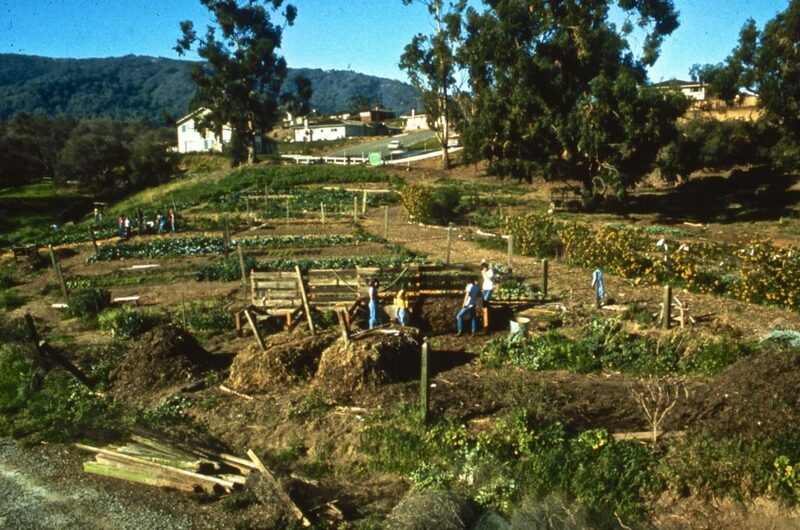 Betty Peck got the local Saratoga government to agree to the garden project; Saratoga rented a ten acre plot of former farm land, and then Alan, along with some of his Santa Cruz apprentices, and other volunteers, began to create the Saratoga Children’s Community Garden in 1972. Alan lived in the Saratoga area for a short while, after departing from Santa Cruz. Alan’s move to Saratoga also spawned his giving public lectures, which he presented at schools and at Villa Montalvo, a local estate in Saratoga. The Garden, an outdoor classroom for both gardening, community events and festivals, flourished from 1972 until 1987, enriching the lives of many children and adults alike. The Saratoga Garden thrived until 1987, when the landowners reclaimed the land for an affordable housing project. The photos of this garden, one of Alan’s most charming projects, demonstrate the beauty and quality that Alan always strived for. Most all of the work done, creating and maintaining this garden, was done by Alan’s former apprentices, children, and other local community volunteers.